Jet lag. It’s the biggest force out there trying to make travel less fun. As someone who used to cross the Atlantic at least once, and up to three times, a month for a couple of years I can tell you that I’ve tried all the magazine solutions. Stay hydrated, get exposure to early morning sun at your destination, melatonin, sleeping pills on the flight, stay up late, nap, don’t nap, don’t drink alcohol on the plane (ok, maybe I didn’t try that one). I hate to break it to you, but it’s like hangover cures. Nothing really works. You have two tools at your disposal, and you have to choose the appropriate time for each, and you have to use them both. You can Inebriate, or you can Caffeinate. That’s what you’ve got. I usually spend Cocktail Friday working on the inebriation side, so today I’ll do something about the caffeination. I know it’s not really a cocktail, but stay with me on this – it’s important. 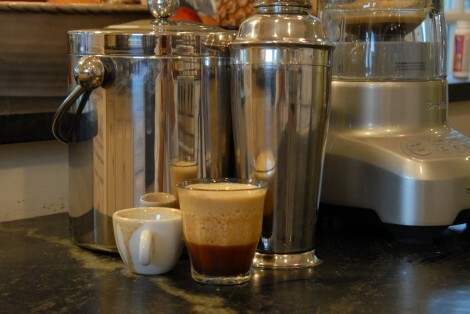 A Shakerato is fresh espresso, with a bit of sugar added, shaken vigorously with ice (or blended) until it becomes a completely different thing. It gets thick, and smooth, and frothy. It looks like it has had dairy added, and it goes down smooth and sweet. And, it really pisses some coffee people. So if you don’t have an espresso machine at home, try to find a friendly barista in advance. Using a shaker cup: Pour espresso into the shaker cup along with sugar and swirl to mix. Add the ice and shake vigorously for 45-60 seconds until the ice is broken up and melted. It will be almost impossible to strain through the cocktail shaker top, so remove the lid and carefully pour the drink off of any remaining ice into a small glass. Using an electric blender: Add all ingredients to the blender cup and blend for 30-45 seconds until all of the ice is consumed. Pour into a small glass. 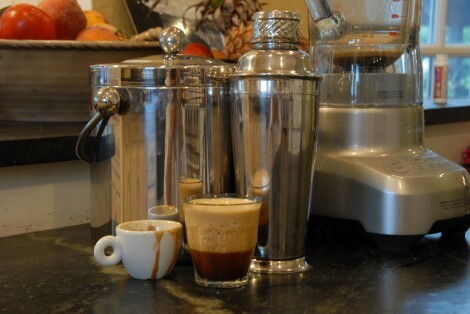 You did a very interesting and professional job in demonstrating the Shakerato. I tried it with my Vita-Mix on a medium speed and it worked beautifully – and the taste was outstanding. Many thanks. Thanks Jim, I’m glad you enjoyed it!